Martin Lishman stand at Four Oaks, an exhibition area of 13,000 square metres under glass. 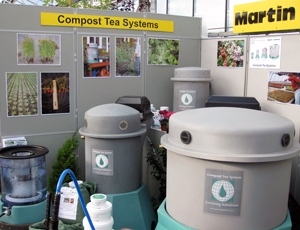 Attendees of the 39th annual Four Oaks commercial horticulture trade show, a 23 acre site in Cheshire, were enthusiastic about the use of compost tea and related products displayed by Martin Lishman, Ltd., distributor in the UK and Ireland for Growing Solutions. Dr. Gavin Lishman and I met with many growers who were familiar with our Systems. 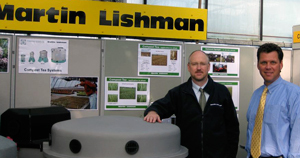 “Seeing the quality and simplicity of the Growing Solutions range, as well as hearing of specific benefits such as reduced fungicide and fertiliser use were the key factors that caught hold of people’s imagination,” Dr. Lishman added. Dr. Gavin Lishman and Michael Alms at Four Oaks 2009. The GSI System10 holds a seat of honor near Graze's Buddha on the rooftop. The roof of Glide Memorial Church, located in one of San Francisco’s harshest urban environments, is “growing.” This rooftop edible, community-produced vegetable garden, dubbed Graze the Roof, is maintained primarily by youth from the local area and raises food for the homeless population. A progressive church and nonprofit organization, Glide has provided resources for the underserved for more than 45 years. Graze features soil-less gardening vegetable growers; self-watering containers; lightweight garden beds made from milk crates; a worm composting system, vermicompost tea, and an educational mural that ties the whole project together. Glide youth and volunteers from throughout the Bay Area maintain the garden and host monthly tours and workshops. Seed to Belly is Glide’s experiential workshop for children that teaches the essentials of the food cycle. 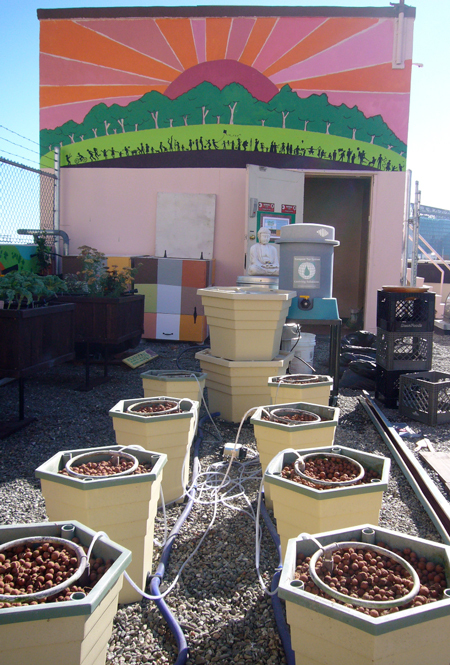 The Growing Solutions System10 residing on the roof is highlighted in this educational program in conjunction with composting and methods for creating healthy soils to boost plant growth. The System10’s vermicompost tea is used with the hydroponic system, currently growing tomatoes, and to amend the vegetable beds. (left) Children learn where their food comes from at Graze's Seed to Belly program. (right) Graze the Roof at Glide Memorial Church. Break It Down Composting and Growing Solutions at AgQuip 2009. Growing Solutions Australian distributor Break It Down Composting enjoyed a stellar debut at the 2009 Commonwealth Bank AgQuip, the largest agricultural show in the southern hemisphere. The three field days attracted more than 100,000 visitors to Gunnedah, many making their way to Luke and Melissa Bowman’s display of the entire Growing Solutions Compost Tea System family. The Growing Solutions Compost Tea System family, including the clear tank System10 providing a birdseye view of fine bubble diffusion. With their country boasting more certified organic acreage than any other in the world, Australians were open and receptive to compost tea as a safe and cost effective alternative to conventional chemical methods. Luke also emphasized that many Australian agricultural professionals, from large cattle operations to specialty crop producers, are shifting their focus to greater land stewardship, seeing compost tea as an ideal component in this new approach to land management. Well done mates! Scott LaFleur (at right) talks to Garden Shop customers about compost tea and the Growing Solutions System25. Organically speaking, the proof is in the pudding, or in this case, the Garden in the Woods, owned and operated by the New England Wild Flower Society (founded in 1900). 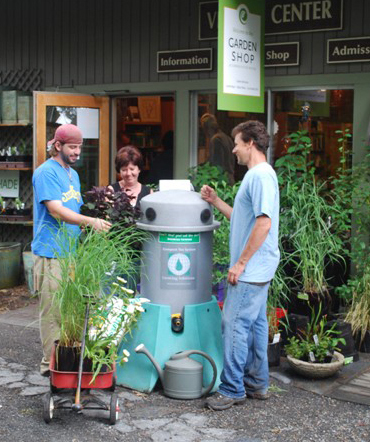 Here, the Society’s Garden Shop brews its own compost tea and uses it throughout the 45-acre public botanic garden in Framingham, MA. 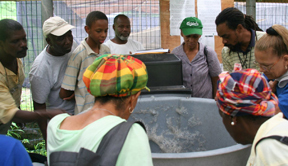 This June, a “compost tea party” hosted by the Dominican Ministry of Agriculture, Fisheries and Forestry gave area farmers a hands-on experience of compost tea and the Growing Solutions Compost Tea System100. Held at the newly renovated Hillsborough Horticultural Centre, the site visit provided ornamental flower and vegetable producers with a detailed overview of the uses and benefits of compost tea. 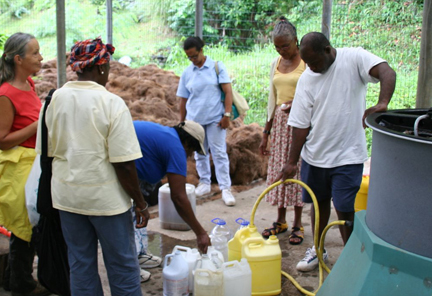 The use of brewing machines, while a relatively new technology to the Commonwealth of Dominica’s agricultural sector, brings enormous potential. 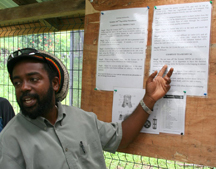 The Giraudel farmers—from Dominica’s “Flower Capital”—and the Bellevue Chopin organic farmers expressed deep appreciation to the extension personnel for exposing them to such new and innovative technology. They were more than convinced that within the community of Giraudel, the production of cut and ornamental flowers would see a significant boost with the use of compost tea. And, they agreed it was necessary to embrace organic production to further enhance Giraudel’s ecological integrity. Mr. Keian Stephenson, Agricultural Officer, explains that the biology of compost tea and its effect in the plant phyllosphere are complex. 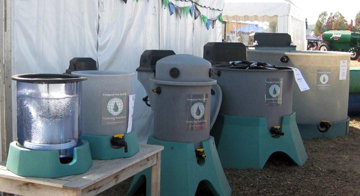 The Bellevue Chopin Organic Farmers will use their grant-funded Compost Tea System25 to develop biological crop protection solutions and botanical sprays for on-farm adaptive research trials.